The Hostel grounds were fantastic: up on a forested hillside overlooking the city. 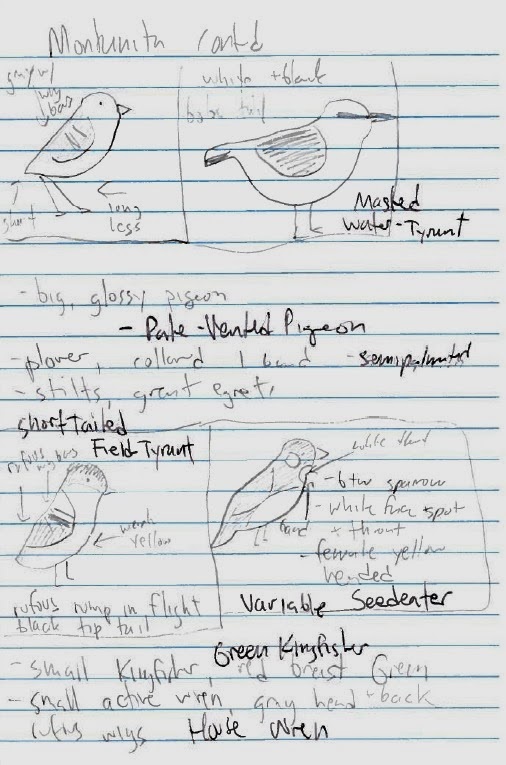 I didn't make a lot of sketches there because I was able to lay in a hammock all day with the field guide on my chest taking a good look at the birds I saw. The Pacific Hornero was cool, as I'd never heard of them before. 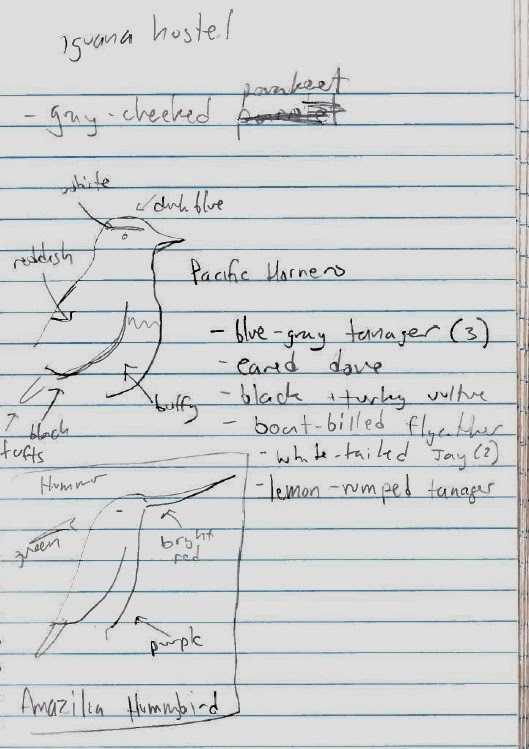 The hummingbird I remember not feeling great about the ID...and looking at photos now it doesn't seem to match my drawing. Ah well. Ah, Montanita. Our destination was a dusty little surf town on the coast. It was ... fine. Not of us were very good surfers and when we arrived we took one look at the huge waves and backed off. We spend our days laying in hammocks, reading books, wandering the beach, running away from packs of stray dogs, drinking, not being able to communicate with anyone, and eating pineapples and ceviche. Each morning, before it got too hot, I'd sneak off and walk to a little patch of forest that I'd found, and look for birds. I was always a little apprehensive - I didn't speak the language and I was probably trespassing, but the birds were great. 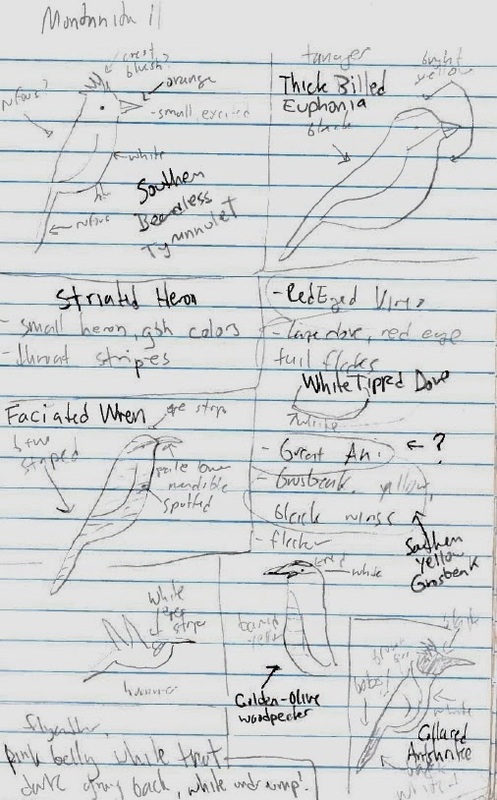 I'd sketch them or write down what I saw, return him and flip through the field guide to make the IDs (or try, anyway). Thick-billed Euphonia! Collared Antshrike (I remember liking this guy the most)! Golden-olive Woodpecker! Masked Water-tyrant (I remember being stunned by this guy, black-and-white seemed out of place when everything else was so colorful)! Short-tailed Field-tyrant (look at his little legs!) Variable Seedeater! I made a quick stop at Isla de la Plata (aka the Poor Man's Galapagos) and saw my first albatross, Waved, and a ton of frigatebirds and boobies and tropicbirds, then it was back for a night in Guayaquil (where I picked up Ecuadorian Thrush and what is now called Whooping Motmot), before taking the long flight home. 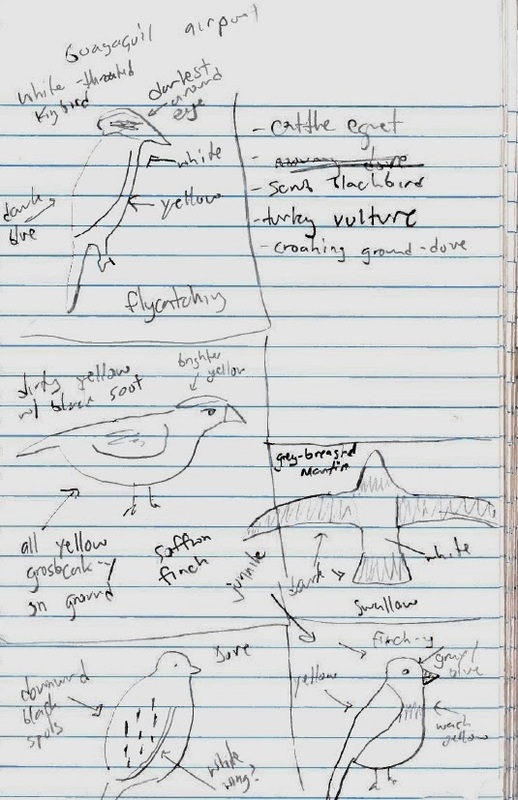 My crummy little sketches were made during the heat of the chase, and even though I saw fewer species than the typical Ecuadorian birder identify from his bedroom window, it was birding at its most pure and most fun. These sketches are wonderful! I've done this (you're much better at sketching tho! 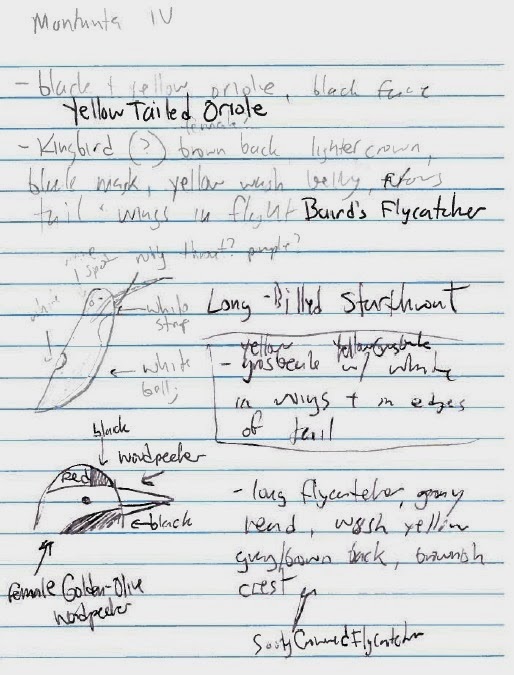 ), but now I use a little mobile phone that let's me record my notes. What's really great is even though you "only" identified 56 species, you OWN those species! I love this post. There's nothing like looking at a bird without already knowing what it might be. More birders should do this, even for the common birds.